Emergency responders get a high-five from the volleyball teams. Maiden Emma Wheeler serves the ball. Maiden Brooklyn Kenelty has the ball. Lady Bulldog Addison Arlint battles Maiden Madison Clairmont at the net. RONAN – The events of Sept. 11, seventeen years ago, were remembered before the girl’s volleyball game on Tuesday. Emergency responders, law enforcement and those who responded to the Twin Tower events were honored. Local responders were also thanked for the work they do to help people every day. Ronan Athletic Director Lucky Larson spoke to the crowd with words to honor the responders while spectators respectfully stood. 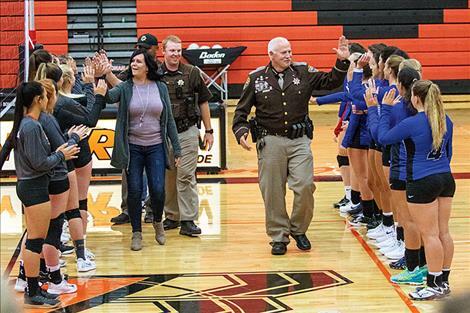 Local law enforcement and emergency responders lined up to receive high-fives from the volleyball team before the game started. The Maidens prevailed on their home court over the Lady Bulldogs in straight sets 25-7, 25-19, 25-20. 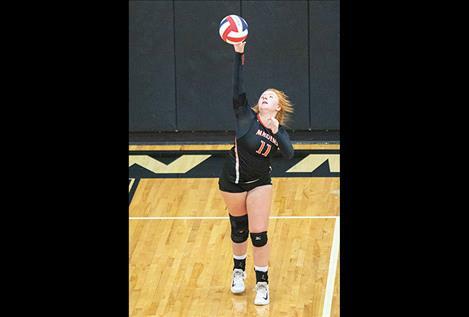 “The Maiden’s had a tremendous game against the Lady Bulldogs,” said Maiden head coach Charla Lake. To open up the first set, the Maidens came out strong scoring the first points and quickly jumped out to a 10-0 lead. The Maidens took the first set 25-7. In the second set of the night, things looked a little more hopeful for the Lady Bulldogs. 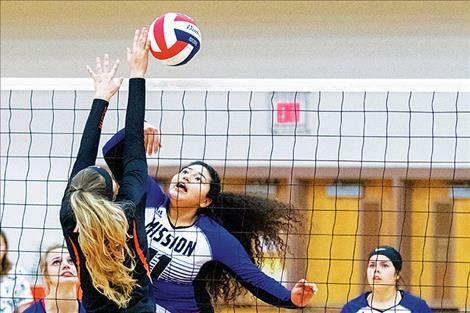 Mission kept things close until the mid-point of the match at 12-11 when Ronan went on a 6-2 scoring run, eventually winning the second set 25-19. In the third set, the teams played a back-and-forth battle for points. The largest lead was only one point for either team until the Maidens brought the score to 15-14. Up by one, the Maidens took control of the match going on a 10-6 scoring run clinching the set and match 25-20. Karolyna Buck led the Lady Bulldogs with seven kills. 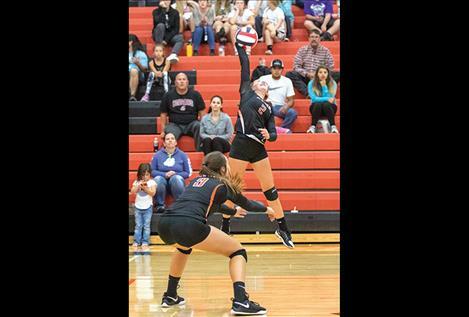 Hunter Eichert had 12 assists and Caitlyn Sorrell had 18 digs. 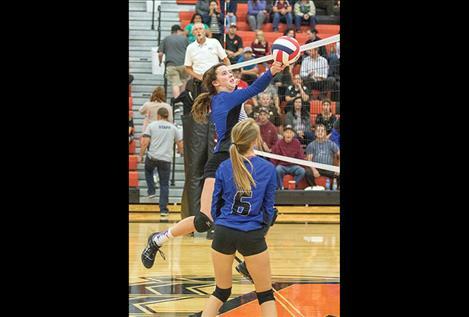 “Madeline McCrea had eight blocks in three sets which is incredible,” Lake said. “The team was very scrappy. Brooklyn Kenelty led in digs; she was working hard to keep the ball in play. We only have one senior this year on varsity, Tiana Ulutoa. She is a great leader. She is always positive and keeps the girls focused on our goals.” Ulutoa finished the game with nine assists. 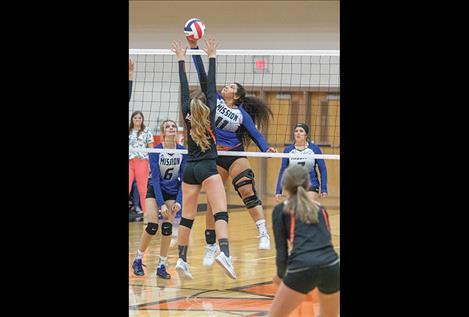 McCrea had five kills, and Kenelty added seven digs.